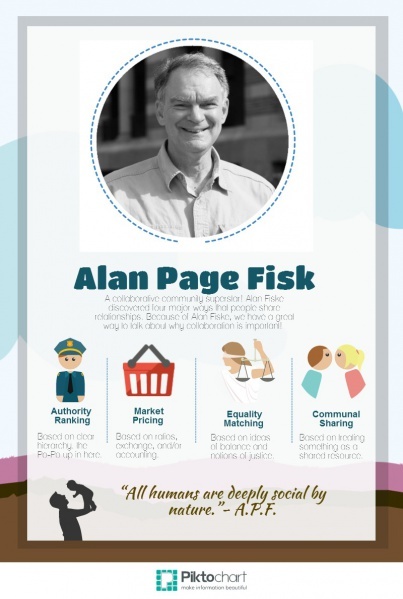 The foundational manuscript on P2P theory,uses the relational model used by anthropologist Alan Page Fiske, to conclude that the peer to peer relational dynamic is a form on 'non-reciprocal' or generalized exchange. In Fiske's model, it is called Communal Shareholding. The implication is that Peer Production does not function as a Gift Economy (which corresponds to Fiske's category called Equality Matching), as is often mistakenly claimed. Communal Sharing (CS) is a relationship in which people treat some dyad or group as equivalent and undifferentiated with respect to the social domain in question. Examples are people using a commons (CS with respect to utilization of the particular resource), people intensely in love (CS with respect to their social selves), people who "ask not for whom the bell tolls, for it tolls for thee" (CS with respect to shared suffering and common well-being), or people who kill any member of an enemy group indiscriminately in retaliation for an attack (CS with respect to collective responsibility). social status systems such as class or ethnic rankings (AR with respect to social value of identities), and rankings such as sports team standings (AR with respect to prestige). AR relationships are based on perceptions of legitimate asymmetries, not coercive power; they are not inherently exploitative (although they may involve power or cause harm). 3. and restitution in-kind (EM with respect to righting a wrong). Market Pricing relationships are oriented to socially meaningful ratios or rates such as prices, wages, interest, rents, tithes, or cost-benefit analyses. Money need not be the medium, and Market Pricing relationships need not be selfish, competitive, maximizing, or materialistic -- any of the four models may exhibit any of these features. Market Pricing relationships are not necessarily individualistic; a family may be the CS or AR unit running a business that operates in an MP mode with respect to other enterprises. 6. considerations of "spending time" efficiently, and estimates of expected kill ratios (aggression as MP)." Every type of society or civilization is a mixture of these four modes, but it can plausibly be argued that one mode is always dominant and imprints the other subservient modes. Historically, the first dominant mode was kinship or lineage based reciprocity, the so-called tribal gift economies. - "One psychologist (Fiske, 1993) posits that all social relationships reduce to four forms of interaction: communal sharing, authority ranking, equality matching, and market pricing. People develop their capacities for social interaction in that order, from infancy through early childhood. The sharing, ranking, and pricing forms correspond to the tribal, hierarchical, and market forms, respectively. The equality-matching form, which is mainly about equal-status peer-group behavior, does not correspond to any single form; it has some attributes that fit under network form, but other attributes (e.g., reciprocity, feuding, revenge) fit better under the tribal form." a deeper issue here is whether the tribal and the network forms are all that different. i think they are. and i'd like them to be so. i write several pages about this. but as i note, if it turns out that the new network form is an upgraded version of the old tribal form, then the timn framework should be converted into a three-form framework, and what will come next later in spiral fashion is an upgraded version of the hierarchical form." " Although I’m not an expert on economic anthropology, I think it’s clear that it’s crucial to distinguish between two types of ‘tribal’ societies: First there are subsistence hunting and gathering societies, which have little or no stored surplus. Although it’s a big generalization, the dominant principle for production and exchange in these foraging communities is usually CS; they are often strongly anti-AR. Second, there are a few hunting and gathering societies with stored surpluses and there are agriculture-based socities, in which AR is prominent (institutionalized and more or less heridtary chiefs and then kings) and there are varying degrees of EM. In socities based predominantly on pastoralism, communities are much more fluid, but AR is also prominent. MP also very gradually emerges in agricultural societies, but pastoral societies are often resistent and opposed to MP. EM seems to become more dominant at a much later stage, with the rise of manufacturing, perhaps. Meanwhile, MP continues to expand right up to the present, but the mix gets complex! Fiske, A. P., & Haslam, N. 2005. The four basic social bonds: Structures for coordinating interaction. In Mark Baldwin, Ed., Interpersonal Cognition, 267–298. New York: Guilford. This page was last modified on 13 July 2014, at 02:08.